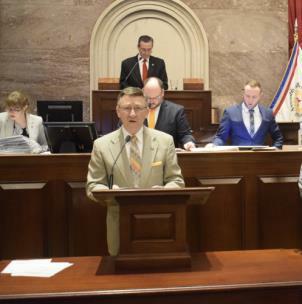 State Rep. Dan Howell (R-Cleveland) has successfully guided House Bill 951 through the Tennessee House of Representatives. The measure - which is part of Governor Bill Lee’s legislative package this year -removes licensure requirements for citizens who provide direct care to a group of no more than three people with intellectual or developmental disabilities in a Medicaid home or community-based services program. The overall goal is to increase the quality of care available, so these important groups are empowered to live successfully in their communities. His office said, "Traditionally, the Governor’s legislation is sponsored by the House Majority Leader or the Assistant Majority Leader. Because Chairman Howell has prioritized the needs of our intellectually, and developmentally disabled, he was asked by the leadership team to carry this important legislation on their behalf."